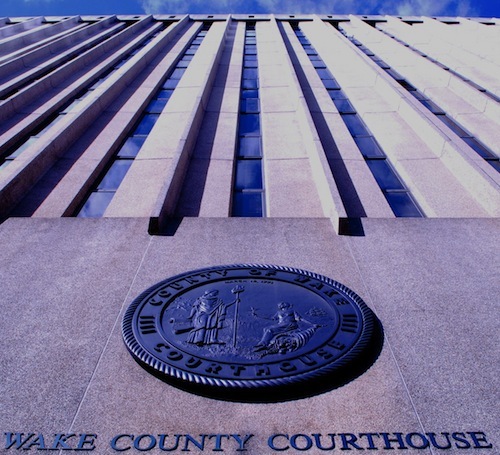 We have a basic failure of our justice system in Wake County, NC. On Tuesday, June 4th, Shon McClain was critically injured by officer Markeith Council at the Wake County Detention Center. Council (a former football player, 6′-3″, 290 lbs.) picked up the much smaller McClain (5′-7″, 119 lbs.) and slammed him head first to the tile floor not once but twice. If you have the stomach to watch the video of the incident, you will see that the second time Council picks him up, McClain’s body is entirely limp. Council slammed him anyway. The report starts by calling the incident an “altercation,” then accuses McClain of “assault” on Council, then reinforces this false narrative by saying that Council was “recovering from his injures at home.” After watching the video, WRAL’s account is clearly ridiculous. Instead of doing actual journalism, they serve as nothing more than a mouthpiece for the sheriff’s office, dutifully repeating back to us the spin they are given. It would have been worth a trip to see Council’s “injuries” first hand to see if they amounted to enough to stay home for or if maybe he could have changed his Band-Aid on his break. The article also flippantly mentions this was the second incident of officer misconduct in as many weeks. The other incident led to the officer being dismissed, but WRAL did not report on that incident at all. They weren’t alone. The News & Observer did not report on the earlier incident either until after the more serious (and impossible to ignore) McClain abuse. The N&O didn’t run anything on this until June 12th, when it gave the same basic narrative WRAL had, albeit with a longer history of issues with detention officers assaulting inmates and never being criminally charged. Here is a link to N&O’s first report: http://www.newsobserver.com/2013/06/12/2959074/sbi-probing-jail-altercation-that.html. Unlike the prior incidents, Council was held accountable, well, somewhat. He was found guilty yesterday and sentenced to an unbelievable 90 days in jail. That’s it. For violently killing a helpless man he will spend 3 months in prison. This sentence from the same court system that recently sentenced Matt Coakley to 6-8 years in prison for a barroom fight where Coakley defended himself and merely injured the assailant. This is only one case that I personally know about. There are dozens of others that I catch rumor of but it is hard to know what is going on because we don’t have any actual journalists in Raleigh covering the court system. So I guess we have (at least) three failures here. We have a detention facility with a somewhat long record of brutality, most of which has been ignored by the press and the prosecutor. We have a press in Raleigh that doesn’t seem interested in basic issues of justice or for some reason doesn’t ask hard questions and find out things. We depend on them to hold people in power accountable and they aren’t doing that very well. And we have a judicial system that seems to have lost all sense of justice. Holding a man in jail for over a month awaiting trial for drinking a malt beverage in public. (This was the misdemeanor McClain received the death penalty for.) Regular, systemic abuse of inmates and detainees. Selective prosecution. Sentences that bear no resemblance to the crimes they seek to punish, make no sense, and are (at best) arbitrarily given out, or (at worst) influenced by illegitimate factors like race, occupation, or favoritism. 17 After saying all these things, Jesus looked up to heaven and said, “Father, the hour has come. Glorify your Son so he can give glory back to you. 2 For you have given him authority over everyone. He gives eternal life to each one you have given him. 3 And this is the way to have eternal life—to know you, the only true God, and Jesus Christ, the one you sent to earth. 4 I brought glory to you here on earth by completing the work you gave me to do. 5 Now, Father, bring me into the glory we shared before the world began. 6 I have revealed you to the ones you gave me from this world. They were always yours. You gave them to me, and they have kept your word. 7 Now they know that everything I have is a gift from you, 8 for I have passed on to them the message you gave me. They accepted it and know that I came from you, and they believe you sent me. We don’t get any of that here in John. This entire chapter is a prayer from Jesus to the Father, but it is nothing at all like those other prayers. If we wanted to reconcile the accounts we would need to ask whether John’s prayer comes before or after the others. Did Jesus pray confidently and then break down or did he break down and then recover enough to pray confidently? There are examples in the Psalms of each type of movement and I have done it both ways (you probably have too). I don’t feel a need to figure this out but it is interesting to let the confidence of John’s Gethsemane sit on a garden bench next to the desperation of the other Gethsemane accounts. There are also interesting features within this prayer. For some reason Jesus uses the third person to talk about himself to the Father in prayer in v.1-3 before switching to the first person for the rest of the prayer. One commentary tried to make the point that this is a normal way of praying, but, um, no, it’s not. I don’t think I have ever once used my full name when praying for something relating to myself. In fact, I just tried it and it felt as weird as I thought it would (try it, go on, try it. See what I mean?) The commentator’s point though was that “Son” and “Christ” are actually more titles than names and thus good to pray about. I might quibble about “Son,” but certainly “Christ” means “anointed one,” and is a title. The point is well taken. I don’t often pray about “Michael Raburn,” but I do pray a lot about how the words “husband,” “dad,” “pastor,” and “professor” relate to me. We would do well to follow Jesus’ example in referring to the titles/names that connote responsibilities in our lives. We will never fulfill those on our own as well as we can when we rely on the empowering Jesus has been promising since ch. 14. Another interesting feature is the mini-creed in v.3: “And this is the way to have eternal life – to know you, the only true God, and Jesus Christ, the one you sent to earth.” Why did Jesus need to pray this? Is this really something intimate between him and the Father? Or is this one of those ‘prayers’ the pastor ‘prays’ in church that is more sermon than prayer, more for the benefit of the human hearers than the divine Hearer? Those seem so disingenuous and I want to believe Jesus was above that sort of thing. Or maybe John is sneaking some doctrine in, making one last push against those who were denying the divinity of Jesus (remember the Ebionites I’ve mentioned several times) by putting words in Jesus’ mouth. But that is such an easy cop out and more patently false than the (wink-wink) pastory ‘prayer’ explanation. Hold this thought. The last interesting feature for today is that in some ways, this prayer follows the script of the Lord’s Prayer (you know the famous one, “Our Father…”) from Matthew. It’s not a perfect one-to-one (and the details are more than we can get into here), but there are enough parallels that some commentaries build their whole explanation around it. The point is that the confidence Jesus expresses here is in line with the confidence he taught us to pray with. He taught us to address God as “Father” and state our case positively and boldly, just as Jesus does here. John has given us such a divine-leaning take on Jesus that we’re prone to read this prayer not as a prayer. We’re prone not to hear the desperation so present in the other Gethsemane accounts. But I think it is right there under the surface. I think this is the prayer of a man who has risked everything because he trusts the Father, he trusts what he thinks the Spirit has been saying to him. He hopes that this is the right path, all the miracles lend themselves to that hope, but in the end, he is a man facing an uncertain future. Well, he is certain of his impending violent death. Beyond that there is only hope. No certainty. Only opportunity. Jesus recites the faith statement in v.3 to build up his own faith, to remind himself, with the listening Father as witness, of what he believes, of why he is doing this. He recaps all he has done, not in a self-congratulatory way, but as one hoping that he has in fact revealed and brought glory to the Father, according to his anointing (hence the self-naming) and intention. He prays as a man who knows he is leaving human life – leaving behind people he loves and a work unfinished, a work barely begun. Jesus prays here because he trusts the Father. Jesus prays because he hopes his works and teachings have done their part. Jesus prays because he loves his friends, both the ones he had met and the ones he hopes will become his friends down the road. In short, we get a very high, divine view of Jesus here because of what he says. And we get a very low, human view of Jesus because he doesn’t just say, he prays it, trusting it to be true.